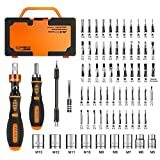 The Best Affordable Screwdriver Sets For 2018 - Get The Best For Your Money! Home » Buyers guide » The Best Affordable Screwdriver Sets For 2018 – Get The Best For Your Money! When you set out in search of a set of screwdrivers you want to consider a few basic characteristics: The type of head, the length, diameter of the shaft, whether it is a simple manual or ratcheting action and the size and comfort of the grip. In my personal opinion one of the benefits of buying a set is that you usually get a selection of flat heads and specialty heads. Most screws today use a Philips head or cross-recessed head as it gives you more bite and leverage when twisting. I rarely use flat head screwdrivers much these days, but it certainly doesn’t make having them any less important because tools are most critical when you really need them. Being prepared is a smart way to live and work. I’ve also come to appreciate models which are magnetized for easier handling of screws. This can be very important when you are trying to insert a screw into a tight spot that won’t fit both of your hands. When working in areas where dropping a screw down into a difficult space would be disastrous (for example: certain areas of cars) this feature has saved me a huge amount of grief! Shaft length and diameter are important when working on vehicles – and disassembling certain items – as some of the screws are in very difficult to get to spots. Those spots are often underneath or behind a lot of other equipment so a long shaft with a magnetic head makes it easier to get to the screw and helps to prevent the screw falling into an inaccessible place. Take it from me, as I’ve done all of it. The shaft diameter is important when working on heavy duty screws which may have rusted in place or when trying to pry something apart with a flat head. If you plan to work on engines and occasionally need to use a large flathead screwdrivers as a pry tool, consider getting a screwdriver with a stronger shaft. The grip is the comfort factor and will definitely come into play when using the screw driver for an extended period of time. If the grip is uncomfortable then your hand will get tired or cramped quickly. This could lengthen the time it takes to complete a project if you have to stop every few minutes to relieve your hand. 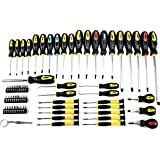 How about we start here: are you looking for a good quality screwdriver set for use around the home or when working on your vehicle? Here’s my first recommendation as I’ve owned several tools by them in the past and never had a complaint. Stanley is a trusted name in tools and is known for its quality tools and craftsmanship. 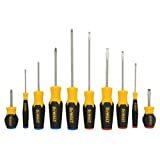 The yellow and black logo is a familiar characteristic for this set of eight screwdrivers upholding Stanley’s long reputation for outstanding tools. The set features four 6” length screwdrivers and four 4” length screw drivers. The longer lengths allow you to get to those hard to reach places, especially when working on a car. They are equally divided into four flat-head and four Phillips head screwdrivers. They have a nice, soft, cushioned grip for ease of use and comfort on longer jobs. Most professionals who use tools already have a strong grip and calloused hands but for the hobbyist or DIY home repair the cushioned grips can really save some of the pain in your hands. I’d advise you to take this into consideration! The tips of the screwdrivers are magnetic which helps with handling screws in tights spots or when trying to juggle the screw driver and something else in the other hand. There are a variety of large and small heads that would fit most common screw head sizes. No holes in the handles to hang them from a tool hook. Overall this is a great set of daily use screwdrivers for both DIY home or auto projects. Stanley is a trusted brand with a long history of quality and durability. The screwdrivers are very comfortable to use and come in fairly standard array of sizes and lengths. The magnetic heads definitely come in handy and can save you some searching around for a dropped screw. The set could use a little more variety with perhaps a longer driver or more medium sized heads. It is a great little set of screwdrivers that will not let you down. Definitely head over and take a look at it at Amazon. It’s a great all-around choice. Craftsman is a trusted name in tools and produces its tools in the US and has done so since 1927. They have also won numerous awards for quality, craftsmanship, and reader’s choice awards. These tools are sold all over the world and they are the official tools of NASCAR. Suffice it to say that Craftsman knows how to make a great screwdriver. I’ve owned a few of these too and enjoyed using them. This seventeen piece set of screwdrivers is essential for anyone’s tool kit. This set comes with enough sizes and lengths to handle just about any job you can think of where you need to tighten or loosen screws. The clear butyrate handles are designed to be durable and very strong and for me the most enjoyable type of handle. The tools are very well balanced and the shape of the handles allow for a strong grip in your hand. They can take a beating on the job without breaking. Each blade is also heat treated giving them good strength and durability. The Craftsman warranty means that any tool that breaks or is defective can be replaced for free. You can never go wrong getting a Craftsman tool set and they will last you for decades. Just be careful who you loan them to since might not get them back! Craftsman tools are known for their quality and that they last for decades. In the event one of the tools is not up to snuff the Craftsman Warranty will replace any defective or broken tool free of charge. The set provides enough diversity to accentuate any set of tools they belong to. 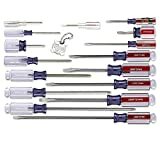 There are enough sizes and variety in heads that you will not need another screwdriver set unless you need precision work done. For most home and auto applications this set will likely be all that you need. You can go check it out and see the other people who love it and get your own so you won’t have to struggle with having good screwdrivers around any more! This fantastic precision screwdriver tool set by Nanch is probably one of the best precision tool sets you could own. The durable heads come with a telescoping handle and they’re magnetized for extra convenience. The set is well designed and the carry case makes it easy to find the right bit for the right job. This set features 22 precision screwdriver bits that fit into a telescoping metal screwdriver handle. The set of 22 tips includes Philips heads, security and standard Torx heads, slotted heads, hex heads, Pentalobe heads, triangle heads, a tri-wing head, and an SP2 head. These high performance screw driver heads are made from S2 steel and the heads are heat treated for better performance and higher durability. Definitely a great choice. The base of the handle is also free spinning for when you need to apply a little pressure but still need the handle to spin freely and makes it much easier to smoothly use them efficiently. The magnetic heads make sure that you never drop a screw (as I mentioned earlier this is one of my favorite features). Overall this is a great quality set of driver bits that will work for just about any application you might find yourself working on. The bits are high quality and durable while the handle has an easy grip and telescopes out for your comfort and convenience. The bits are magnetic which help immensely when handling these small electronics screws. 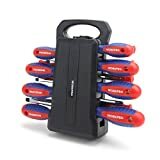 It’s gotten rave reviews on Amazon from professional electronics technicians who use this set very frequently in their work. It’s a cool little screwdriver set I recommend for anyone. The best price is generally over at Amazon so head over and have a look today. Gear wrench is a well-known tool manufacturer and produces a wide variety of tools including this 20 piece screwdriver set. Gear wrench gives you a product that provides you with quality tools at an affordable price. They come in a sturdy plastic box that is perfect for storage and keeps your tools nice and clean. The ergonomic handles are a good balance of strength and comfort and have a built in “speed zone” for lower torque applications. The hex shaped shanks means that you will never suffer from the metal slipping around in the handle. You will always have a good snug fit between your grip on the handle and the blade of the screwdriver. The set features twenty screwdrivers with both imperial and metric tips. Each of the tips are magnetized black oxide for a superior grip with the screw head and prevent the screws from falling into a place where you would not be able to retrieve them. The handles are made from both a rubber and plastic giving you a good grip that is both strong and comfortable. Those same handles are made from materials that are oil and solvent resistant. They also have the sizes laser engraved into the metal shaft of the screwdriver blade which is pretty cool, too. If you want an affordable set of screwdrivers which will provide you with some long lasting and durable tools, then this set is for you. The wide variety of sizes covers most applications and the presence of both metric and imperial sizes means you will never be without the correct tool for the job. The storage tray is the perfect size for fitting in your tool bag. It's a great buy and worth checking out today as it’s a good balance between quality & price. The TEKTON 135-Piece Everybit Ratchet Screwdriver, Electronic Repair Kit and Security Bit Set boasts a bit for every job. It is easy to see why they could say that. 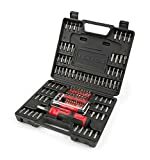 With 102 screwdriver bits and 22 precision bits this tool kit has something for everyone. It is specifically designed for repairing cell phones, tablets, laptop and desktop computers, game consoles, wristwatches, and eyeglasses. It even includes pentalobe bits for Apple products! The set comes in a nice plastic storage container that will keep your bits and ratcheting handle organized and clean. The ratcheting handle has a quick-change magnetic socket that allows you to change screwdriver bit heads out with ease and comfort. The ratcheting action helps when loosening or tightening large numbers of screws and maintains contact between the screw and the screwdriver bit preventing slippage and damage to the screw. There is a large storage space in the handle of the screwdriver to store a few of your most commonly used bits for easy retrieval. The handle can also be set to a non-ratcheting setting. There is a 34 piece set of bits for use specifically with tamper resistant & uncommon screws. These things show up in the most unexpected places so it is nice to have the bits on hand to deal with them when necessary. 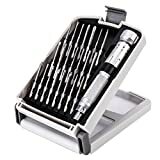 The 27 piece set of precision tool bits are designed for use with cell phones, handheld gaming consoles, game controllers, and a variety of consumer electronics. The kit is definitely large and contains a wide variety of bits for every conceivable application. Many customers on Amazon are complaining that the bits themselves are not very durable and can bend or break during normal use. You would probably not want to use these bits in a power tool as the increased speed and torque could easily damage the bits in this set. It would seem that the quality is just not there for this kit despite the large variety of bits included. If you're ready for being prepared go check out the current price so you’ll be able to finally have every bit you could want! Screwdrivers are a key component in your tool kit and should not be chosen lightly. I take my tools seriously and I’d advise you to do the same. 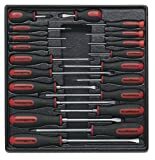 Depending on what you will be using your screwdriver sets for it would be a toss up to choose between the Craftsman seventeen piece set and the Nanch precision screwdriver set. Both have the quality and a great warranty standing behind them. They also have a wide variety of heads and sizes and both sets come with a replacement warranty. The Craftsman set would be perfect for the home owner who will be working on DIY projects or those of you who like me like to do their own auto and boat repairs. The large easy grips and strong blades and tips means you won’t have your tool fail on you just when you need it most. The Nanch set is perfect for those folks who work on electronic devices or computers for a living. The durable tips and telescoping handle means you won’t strip a screw while trying to remove it from a device or computer. Both sets have a lot of positive reviews on Amazon with many customers actively singing the praises of each set. While basically each geared towards slightly different purposes, both are great and would make an excellent choice. Remember- if you have any questions or comments, feel free to let me know!